Bold flavors, minimal ingredients, and a passion for flame! 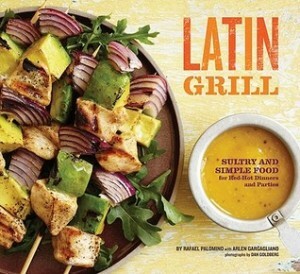 Discover a new spin on grilling, Latin-style, with more than 70 recipes by renowned chef Rafael Palomino, a pioneer of the fresh culinary territory known as Nuevo Latino. A little bit French, a little bit South American, this cuisine is huge on flavor! Bring a fiesta to the table with uncomplicated recipes for everything from grilled Caesar salad to Palomino’s famous burger and deliciously simple desserts. Cooling ceviches and juicy cocktails such as Blueberry-Pisco Sours and Grilled Pineapple Mojitos make every meal a spicy sensation. I’ve never really eaten Latin food before so I thought this would be a good Latin cookbook to start with since I love cooking on the grill. To be honest, most of the recipes didn’t appeal to me a whole lot, but with some minor tweaking I think I could enjoy them. One example is the lamb recipes. I don’t like lamb so I’d have to use another kind of meat, probably chicken. If you ever find a recipe that sounds really good except that it has a meat you’re not really a fan of, you can use this chart to see what a good substitute is. I do like the other ingredients frequently used in this cookbook, so I’ll probably be using it from time to time when my family gets together for a cookout. My son and his family are vegan, and there are also recipes that will work for them, or vegetarians. I love the photos that are in the book. They make everything look yummy, even the Shellfish & Seafood, which I’m not a fan of. NOTE: You need the recipe Sweet Shallot Vinaigrette also, and since you need to chill for an hour, I’m listing it first so you can let it chill while you’re making the tomatoes. 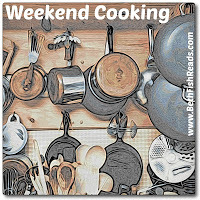 In a medium saucepan over medium heat, cook the shallots and sugar, stirring constantly, until the shallots start to soften and brown, about 3 minutes. Remove from the heat and combine the caramelized shallots, vinegar, and oil in a blender and mix until well blended. Season with salt and pepper. Chill for at leas 1 hour before using. Use immediately or keepfor up to two weeks. In a medium bowl, combine the mushrooms with the olive oil, shallots, rosemary, and thyme; let sit for about 10 minuets. Meanwhile, prepare the tomatoes so that you can use them to serve your salad in. Preheat the oven to 325F. Using a sharp knife, slice the tops off the tomatoes either flat or in a zigzag pattern/ you need them later so don’t discard them. Using a melon baller or spoon, scoop out the insides. (you may want to save the insides for a sauce or another salad). Set aside. Place the tomatoes into a 1 inch baking pan (you may have to adjust the bottoms-cutting carefully and only slightly-if they can’t sit upright) with their tops. Bake until the skins start to wrinkle, about 15 minutes. When the tomatoes are finished, remove the tops and stuff with alternate layers of the mushroom mixture and the cheese. Place the tomatoes back into the oven (without the tops) just until the cheese starts to melt, about 5 minutes. Top each tomato with a bit of the mixed baby greens and a drizzle of the vinaigrette. Cover with the tomato tops and serve. I’m not a big lamb fan either, but I do like grilling recipes. Will look for this one at the library. Thanks for the review! Mmmm that tomato salad sounds so fresh!! I love lamb but haven’t really sought out a good place to get it in town so we never cook it–which I guess makes it that much more of a treat when we are having a special date night without the girls. 😉 Thanks for the substitute link, though–that’ll come in handy! Coming from New Zealand, not liking lamb is not an option! Cheers from Carole’s Chatter! I adore lamb, so those recipes would be perfect for me. That substitute chart is a cool thing, though. And the tomatoes sound really good. I don’t think I’ve ever had Latin food so I’m intrigued. I’ll have to check this out. We eat Cuban food from an authentic restaurant here and I also prepare Cuban at home. That’s a cuisine I love, my sister in law is Cuban descent and her mom gives us lots of recipe and food! For us, we both love lamb. That tomato salad is amazing! Saving your recipe on that one. This looks and sounds so good, Vicki! I don’t eat lamb either, so I’d use chicken or try to go meatless. Have a wonderful Sunday! Well, I love lamb, and grilling both, so this book sounds like right down my street.